The Tiger Shrimp is a freshwater animal that has got tiger-like black stripes that adorn its beautiful body. The shrimp is a great choice for beginning shrimp aquarists because it doesn’t need intensive care like some other shrimp species. Since its introduction to the aquarium hobby, it has widely been accepted and it continues to become very popular amongst aquarium enthusiasts. Keeping the shrimp is also quite economically friendly owing to the fact that it doesn’t demand lots of care and effort for it to survive in captivity. It is a very active swimmer that needs sufficient space for it to move about especially if they kept in a group in captivity. The shrimp can be housed together with other species like the Cherry shrimp in the same tank. As earlier said that the shrimp is a great choice for beginners in the hobby, breeding it requires someone who experienced enough. There are lots of parameters that go in when you need to breed the shrimps that beginning aquarists may not successfully achieve. The head and the tail show a yellow coloration with the body exhibiting black stripes that run along it. The red tiger shrimp also looks almost similar to the tiger shrimp but its stripes appear red and not black. It is interesting to note that the tiger shrimp and the red tiger shrimp can mate and produce an offspring. The resulting offspring will acquire characteristics from both the parents and exhibit physical features from both. 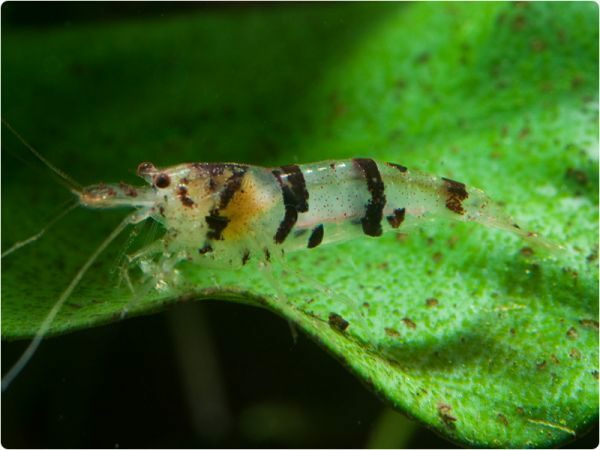 Hybrid offspring of both the two shrimp species can exhibit either black or red stripes or sometimes show the features of the red cherry shrimp. The Tiger Shrimp is native to the Asian continent and is fairly distributed amongst some Asian countries. In China for instance, the shrimp is found in the southern region in freshwater areas where it lives in the wild. It is a fresh water inhabiting shrimp that is found in small streams and rivers in the wild. It is a fresh water shrimp so provide fresh water for it in the tank. The water pH should be should be regulated to be between 6.5 and 7.5. Just ensure that the tank water is soft. Ensure that the tank water is clean at all times because any form of impurities there will be fatal to the shrimp. The temperature of the tank water should be regulated to be 76-78°F. You can measure the exact temperature of your water with a good quality aquarium thermometer. Perform frequent water changes to ensure that the shrimp survives in there. You can do at least 10% tank water change in order to help improve the conditions for the animal there. Another important thing to think about is the level of substances like ammonia and nitrate. These need to be kept absolutely down for the animal to survive. Don’t provide much lighting as the shrimp prefer darker areas to live in. Feeding the shrimp is quite easy even when it is in captivity as it will readily eat a variety of foods. You can offer the animal foods like; spinach, lettuce, zucchini, algae wafers, and flakes. It is best to give the shrimp a balanced diet to help keep diet problems like nutritional deficiencies at bay. You can feed the shrimp once or two times a day. The other foods you can offer it include; blanched vegetables, hikari crab cuisine, and omega 1 shrimp pellets. Please also note that once you provide the shrimp food in the tank after 2-3 hours all the food needs to be consumed. If you notice that after this time all the food is not eaten, it is either you are offering too much food or they are scared to come out and eat. Shyness in Tiger Shrimp is a problem that can prevent it from feeding well and it is usually caused by insufficient hiding places or bully tank mates. That said it is best to ensure that you house the animal with peaceful animals and offer it lots of hiding places. The males and the females look almost similar although the female have a distinctive round-like structure underneath their bodies. The males are also slightly smaller in size compared to the females. The colors of the male and the female however remain the same and this can really be problematic if you are asked to tell them apart. The tiger shrimp will easily breed just like other species of shrimp once the conditions are conducive. Ensure that the tank water is pure and free of any contaminants this helps to make the animal feel comfortable which is necessary for its breeding. The female shrimp will be able to produce anything from twenty to twenty five hatchlings provided it is feeling healthy and comfortable. The eggs will hatch and the female may take a period of at least seven days to again lay more eggs. Breeding the tiger shrimp is not complicated and once you learn the basics of doing things right, you will soon find that you are an expert in the field! During the period of breeding it is best to give the shrimp small amounts of food but at regular intervals. Remember continuous and reliable food sources for the shrimp is ideal for its successful breeding. Tiger Shrimp is a freshwater shrimp that is native to the Asian continent and some are found in the Southern parts of China. Since its introduction into the aquarium hobby it has really gained a huge number of enthusiasts. It is quite easy to rear in the tank because it is not as demanding as some other species of shrimps. Once you have a tank properly set up with its recommended parameters and ensuring that substances such as ammonia and nitrates are kept low you will be good to go. Performing regular water changes is also desirable to help keep the animal comfortable and healthy for the shrimp. You can purchase the animal across pet shops that deal in fish and other related aquarium animals. I need a profdssional shrimp breeding guide and additive to feed them during nursery.